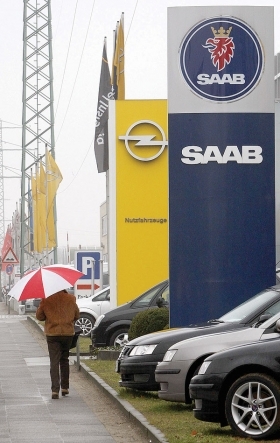 A woman in Hamburg, Germany, walks past signs of two of GM's troubled brands, Opel and Saab. After enduring years of rough weather, Saab on Friday sought legal protection from creditors. General Motors executives were surprised by the speed at which Saab filed for court protection from its creditors last week, leaving them with few answers for anxious U.S. Saab dealers. GM tried to provide that information during a dealer broadcast Friday, but dealers said details were sketchy. "The GM leadership was surprised by the filing and didn't know it was coming, so they are going through scenarios right now that they don't have the answers to, such as buying back inventory and so on," said a Saab dealer who listened to the broadcast. A GM spokeswoman said the company had no advance word about the timing of the filing. Although GM owns Saab, it had moved to set Saab up as a separate entity with its own board. "We knew a filing was a potential, but it could have happened this week or later," Joanne Krell, spokeswoman for the Saab brand in Detroit, said Friday. "It just wasn't entirely clear." The Saab dealer who heard the broadcast said GM assured them it will honor warranties and prepaid maintenance and provide parts. GM leaders told dealers they will be putting more incentives on Saab vehicles in March to help move inventory. GM also said it will begin paying suppliers to Saab Automobile AB the $127 million due for parts shipped as of today, Feb. 23, say GM sources. The move comes after Sweden's government rejected a request for financial aid from GM, the carmaker's U.S. parent. On Friday Saab said it had filed for reorganization under a self-managed Swedish court process. Saab said it would continue to operate normally during the reorganization, with GM and the Swedish government providing some support. The Saab reorganization is headed by an independent administrator appointed by a Swedish court. The administrator's job is to formulate an outline for restructuring and present it to creditors in three weeks. The process will be concluded in three months, at which time the reorganized company either emerges as viable, with new funding from private or public investors, or moves into liquidation.